For those of you who didn't catch the resemblance in my last post, Dr. Who was/is a British sci-fi program that used to air in the United States on PBS. It is perhaps best known for its ultra-low-quality special effects. Thank you, European Court, for making the UK more like Alabama. One of my first responses to the societal train wreck that followed Hurricane Katrina was a sense of being frustrated and outraged and asking, "How in the hell could all this be true?!" Well, maybe some of it wasn't. Are you so inept that you can't break your own car window? Dr. Who scared the bejeebers out of me when I was a child...I can still recall a particular scene of a huge larva that was going to kill everyone. Those special effects looked pretty high budget to a five-year-old! Those EU laws are getting pretty funny, like German Frauleins have to wear higer-necked tops when they work in bars serving drinks. Huzzah for the European Court! Brenda is a hottie, and this gives hope to son-in-laws across the continent! One has to admit, Huw, that those white socks with sandals are pretty stylish. Uhm, I assume she's wearing socks -- she may just have very pale feet. How do you KNOW yesterday's picture was not like Jack the Ripper? I've seen some strange laws, but not many are stranger than the one in the UK, which makes no sense at all. It is my understanding that everybody in the Superdome had a laptop and blogged about their experience. None of them reported any rapes; most of them said it was more like a big party, except for the lack of water, the plugged up toilets, and the heat. What was really bad, they said, was the shortage of food left their tailgate parties a little flat. I knew a "Jack the Ripper" once. He was my buddy John Dickerson who loved... I mean LOVED Mexican food. He could make your eyes water. We called him J the R. Which now would be J to the R to the Ipper. 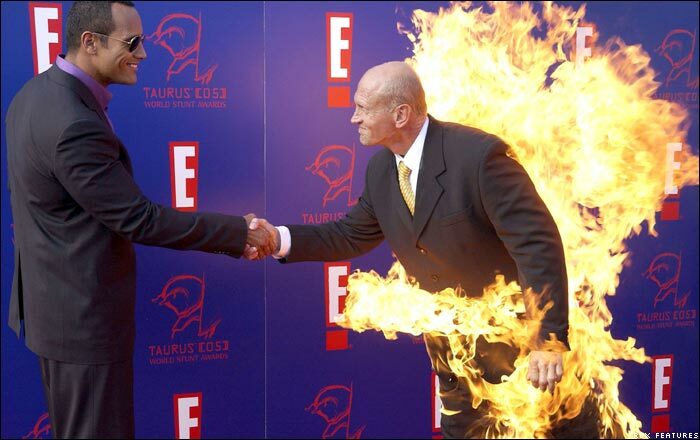 Well, yeah, sometimes you do feel all on fire when you shake someone's hand, but to really be on fire, like the fellow on the pic you like, wow, now that's quite something!!!! The new Dr Who, is a great improvement sfx wise, and the story lines are amzaing, I put it down to the Welsh influence.